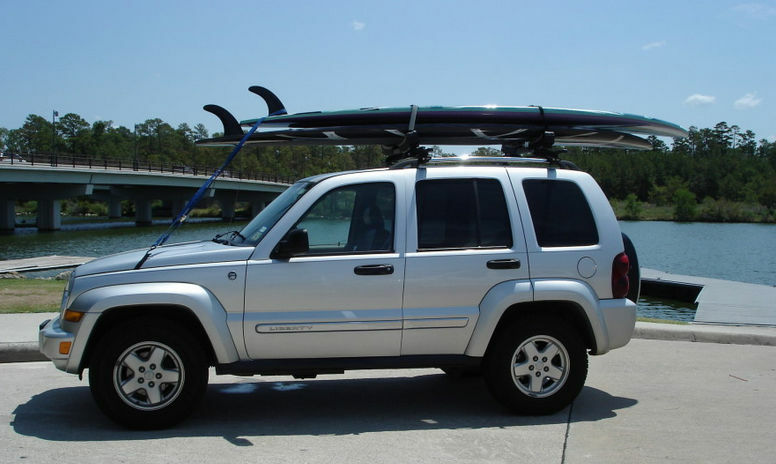 StoreYourBoard Blog: SUP Travel Tips | What Direction Does My Paddleboard Go on My Car? SUP Travel Tips | What Direction Does My Paddleboard Go on My Car? Bottom of the paddleboard up: Logistically, if your fins are in, the rack will only work with the paddleboard fins facing up in the air, or else your fins would hit your car’s roof. Also, you prefer not to expose your wax or board pad to the sun, so top side faces down. And generally strapping the board upside down is better for travel based on any concave of the paddleboard. Fins in the front: It may sound like a Jimmy Buffett song, but in a worst-case scenario, fins may be able to act as a last line of defense against your paddleboard wiggling free and flying off your car because if your boards start to slide backward, the fins catch on the straps and restrict how far backward the boards slide (i.e. not off your car). Also, depending, it’s more likely the tail of your paddleboard is thicker and flatter, so it has more strength and better shape to cut through the air as you’re cruising down the freeway. What Direction Does My Paddleboard Go On My Car?